BRUSSELS (ANA/ M. Aroni) The European Commission will present a positive compliance report for Greece to the Eurogroup later on Monday, European Commissioner for Economic and Financial Affairs Pierre Moscovici said in a doorstep statement as he arrived for the Eurogroup meeting. “The Hellenic Parliament has voted through a very difficult package of measures that asks the Greek people to make new, brave but necessary efforts,” Moscovici said. 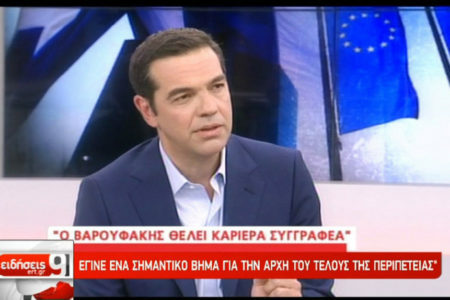 Greece was meeting its commitments and making significant efforts, therefore it was now important that Greece’s partners also assume their own responsibilities, he said. The Commissioner said that the target on Monday was to conclude the second review and to find an agreement for the sustainability of Greece’s debt, with the participation of the International Monetary Fund (IMF). “I hope and believe that we can quickly arrive at an agreement,” Moscovici said, noting that all the actors involved want to reach a global agreement, an overall agreement. The task for the Eurogroup on Monday, he added, was to work to achieve a convergence of views between the IMF and Germany. Moscovici concluded by saying that all possible efforts must be made on Monday to arrive at such an agreement, so that Greece and the Eurozone can look forward to a more optimistic future. “Now the Greek people need to see that there is a response to their efforts,” the Commissioner added.